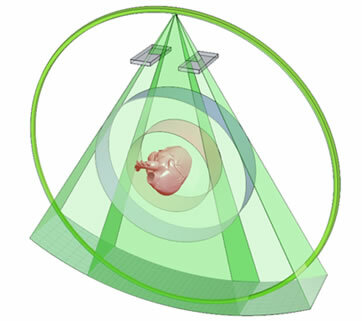 Unlike conventional single- and dual-source CT scanners, CardioGraphe uses dual overlapping cone beams to achieve 140 mm coverage. Stereoscopic imaging provides a more complete data set than mono-beam CT, for better, artifact-free images. Stereoscopic imaging also optimizes the scanner’s dose utilization. 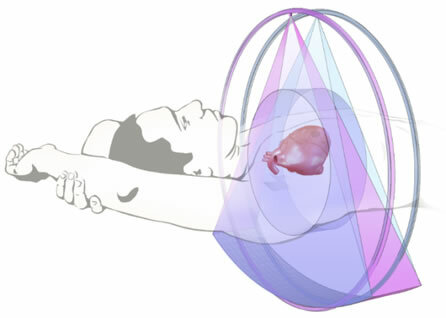 CardioGraphe uses Focused Field-of-View technology for high quality imaging of an area-of-interest, while reducing the radiation dose in peripheral anatomies outside the area-of-interest (shown for a single x-ray source).